Is Cloud Software for Me? A healthcare management system designed around the way practices work. Providers can take comprehensive notes, organize their practice, and promptly bill services. ChiroCloud™ is an all-encompassing Electronic Health Records and Practice Management system designed specifically around Chiropractic treatment. Our goal is to carefully meld every aspect of daily office life into a single easily accessible service, and in the process, eliminate the headaches associated with using conventional information systems. Shouldn't your transition to an electronic healthcare management system be as simple as possible? With our service you will not maintain servers or software, apply patches, or worry about paying for upgrades. Updates are automatic, and every time you login the system is right where you left it. There are more benefits than could be conveniently listed below, so instead we have outlined a sampling of key concepts found inside the ChiroCloud™ service. "They make the note taking easy for us. They are quick to respond to questions or suggestions we have... The tech support we get is really good... the only thing I would say is you need to try it. It's helped my practice!" "Get ChiroCloud! It will organize your office. It makes you very very productive. It cuts your time down like you would not believe... 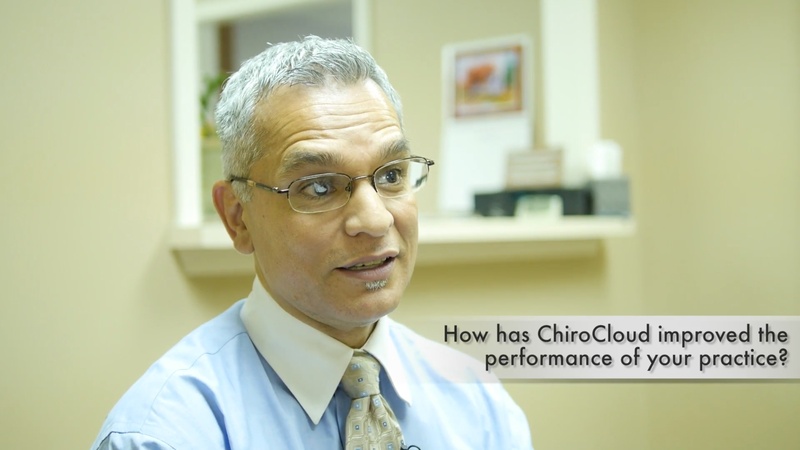 I don't know how we would function without ChiroCloud." Cloud Software is browser delivered software accessible from anywhere with an internet connection. There is nothing to update or maintain, just power on and start working. What follows is a comparison of the three options available to you for managing your practice's records and operations: Paper, Digital, and Us. Anyone operating on paper records for any length of time can tell you, things get real burdensome real fast. We conducted an economic analysis in an attempt visualize how costly a system like this can be over the long term for the average practice. Our results are displayed on the right, under Tangible Costs. Additionally, when operating with paper a number of factors have the potential to become indirect cost drivers, and as such must be kept in mind. These costs are more difficult to quantify and differ from practice to practice. These factors are listed to the left under Intangible Costs. Putting your livelihood in the hands of an inexpensive laptop is a recipe for disaster. You could backup, but when was the last time you remembered to do this? And how solid is your recovery plan? The only way to be moderately prepared is with a rotating assortment of drives traveling between multiple off-site locations. Though, even if you implement a system like this, no drive has a complete up-to-date copy of the information... and what a pain! Since your system is mission critical, you cannot buy a computer at the local big box store. These are not made to withstand an environment like this. You need enterprise hardware — servers, networking equipment, cooling, racking equipment, security measures, the list goes on... And everything must be sized to your needs, which are unknown before running in a real life environment, and these do change over time. This is a complicated proposition... and not to mention expensive! Then, who will maintain this complexity? You can't hire a part-time IT person and expect magic. Systems like this require enterprise personnel with years of experience to properly manage. Constant monitoring and frequent site visits are required to catch issues before they become major work stopping problems. Trust us, you don't want to go down this path. We do this on a day-to-day basis, and believe us, it's not for the faint of heart. Below, we have displayed the costs of managing your own system to the right. This study applies to offices like your own, but the thing to keep in mind is businesses surveyed have experienced IT staff on hand. The indirect costs are listed to the left. Each of these items is something that must be addressed when operating your own electronic records system. After considering the two options presented above and the negative aspects of each, you should be thinking "Wow, I hope there's something better than this, or else I'm packing up and going home!" ChiroCloud™ easily imposes the least amount of stress, our costs are consistent, we understand the difficulties of today's environment, and we are here to help. While conversing with providers excited by ChiroCloud™, we consistently hear the same adoption hesitations. These reservations are listed below along with how we overcome them. "I'm unhappy with the software I currently use, but I spent so much money on it that I have to stick with it." Most of our subscribers have gone through multiple programs before finding the perfect fit with us! "I'm not sure I'm ready to learn something new." ChiroCloud™ is easy to learn! We provide a number of resources to help you transition at a speed that's comfortable for you. "I'm not great with computers." If you have experience sending email, composing documents, or using a smartphone ChiroCloud™ will be a snap! "I'm doing just fine with the software I have." Okay... But! Could you be doing better? Can you access and manage your practice from anywhere at anytime? Have you ever made a suggestion and actually been involved in seeing it implemented? Can you ask a question of your product's developer and expect a timely response? What if your software was designed around the practice, instead of your practice around the software? "I already have software and I dislike the company. Why should I believe you will be any different?" ChiroCloud™ is unlike any other company out there vying for your attention. We are a highly diverse multidisciplinary team with one goal, to help you deliver the best possible care to your patients. "Nowhere else have I ever had a situation where I had somebody want to work and rewrite and make things perfect for us." Chiro Cloud, LLC is the organization that develops, maintains, and supports the ChiroCloud™ application and community. Our mission is to provide systematic products so everyone can live a healthy life. This puts our team at the crossroads of health and technology. To meet this demand, our geographically diverse team is comprised of engineers, industrial designers, analysts, and technologists. Why is your software so inexpensive? Our service's price reflects what is needed in order to maintain, support, and expand the offering while still making the community accessible to everyone, from those just finishing school to those who have numerous years of experience in the profession. Everyone can appreciate not needing to take out a loan for something like software. Shouldn't those loans be for other things like a nice office, comfy waiting room furniture, or reliable computers for your staff? Are there going to be unexpected upgrade fees? No. Everything is included in your single monthly service fee. All software updates, application hosting and access, customer service, technical support, training, everything. It is all included. We are here to help you be successful, not throw up barriers when we find it convenient. How many offices currently use ChiroCloud™? We service practices from all across the United States. We are extending our client base everyday. So, chances are you know or have met someone already enjoying ChiroCloud™. Ready to join the ChiroCloud™ community? Jump over to our Sign Up page with the Join Today! button. Spend a few minutes filling in all the necessary information... and get excited! You have just taken the first step on an amazing journey into the future of health with us! Have questions? Want to see ChiroCloud™ in action? Want to try it yourself? Just checking to see if we're real and not a bunch of robots? We would love to talk with you! Use the Request More Information button to send us an email. Make sure to include your name, phone number, and the best time to call. ChiroCloud.com is the one and only home for the ChiroCloud™ service and application suite. Our mission is to provide systematic products so everyone can live a healthy life. We are always looking for bright, driven, and diverse thinkers. If challenging work that truly makes a difference interests you, drop us a note and we'll check you out.